There appears to be convincing reasons why home owners may not think of laundry the same way ever again with the introduction of the World’s First LG TWINWash washing machine by LG Electronics. Interestingly, the new product gives users the opportunity of washing two loads at the same time. With the current demand of time and energy saving homes appliances, this latest washing machine is all about efficiency and innovation, helping to get more clothes cleaner in less time. It is unique and redefines the concept of laundry. LG is raising the bar to a new level of home appliance innovation generating a whole new set of washing options. LG Twin Wash Washing Machine The new product offers a new dimension of convenience and time saving by significantly cutting down on washing time as multiple loads of laundry can now be done simultaneously. Accordingly, the powerful main washer handles the bulks of the laundry, while the TWINWash Mini can be set to run a different wash cycle. This is even as s maller loads can be washed when needed without having to wait until a full wash load has accumulated, saving user time. It is perfect for delicate or specialized fabrics that requires wash setting such as lingerie or baby clothes and even the gym wear which can also be separated from whites. Commenting on the new innovation, the General Manager, Home Appliances, LG West Africa Operations, Mr. Jiung Park said,” At LG Electronics, we are committed to making life better for consumers around the world by providing thoughtfully designed products that offer powerful performance with uncompromised reliability. Our industry’s TWINWash™ is an epitome of the superiority of technology that we offer and we are optimistic that our consumers will enjoy a whole new level of washing with the World’s First LG TWINWash”. Assuring home owners of doing more in a convenience way with the product, he said that, “ It’s this kind of innovative thinking that has propelled LG to the front of the pack in the washing machine segment.”. He informed that the washing machine also features LG’s unique TurboWash 2.0 technology with its Explaining the functionality of the product, he said that the Nozzles positioned inside the drum of the main washer spray a concentrated solution of detergent directly onto the clothes, improving the unit’s cleaning performance. Another high pressure nozzle, he added, sprays tiny water particles through the clothes during high spin cycles for more effective rinsing. 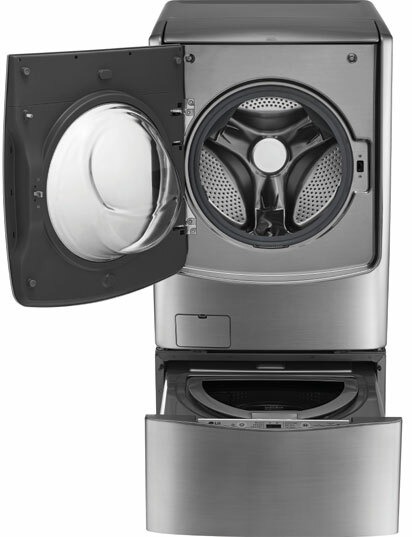 “The revolutionary Inverter Direct Drive motor at the heart of the LG TWINWash is attached directly to the drum, improving efficiency and reducing the number of moving parts, leading to enhanced durability. “Also, the washing machine’s Energy Monitoring feature provides helpful data while LG’s proprietary HomeChat™ service allows users to check the status of their washing machine using everyday natural language. “In addition to its fashioned Premium Ergonomic Design, The LG TWINWash is fitted in the space of a typical front load washing machine so nothing is sacrificed for the added convenience. “The door of the main washer is aligned with the drum’s center, positioned higher than on conventional models and tilted at an angle to make loading and unloading the main drum easier. “The revolution of this product offers a wide range solution to the age old problem of when to do the laundry,” Jiung Park, explained.